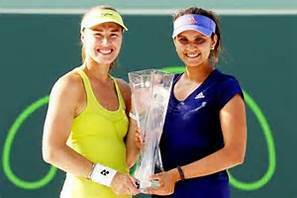 India’s Sania Mirza and her Swiss partner Martina Hingis on Thursday broke a 22-year-old world record by winning their 29th women’s doubles match in a row en route to their entry into the women’s doubles final of the WTA Sydney International, in Sydney. The World No 1 pair came from behind to beat the pair of Romanian Raluca Olaru and Kazakhstan's Yaroslava Shvedova 4-6 6-3 10-8 in a closely-fought semi-final. They now surpassed the pair of Puerto Rican Gigi Fernandez and Belarus' Natasha Zvereva, who won 28 matches on the trot during their successful pairing back in 1994. The Indo-Swiss pair has continued their good show from 2015 when they won 9 titles which included the Wimbledon, US Open and the year-ending WTA finals.